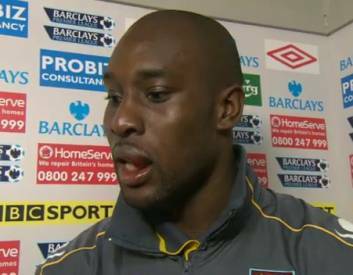 In the process of scoring in West Ham’s spirited, Scott Parker-inspired comeback against West Brom on Saturday, Carlton Cole bust his lip wide open. What the bloody hell is going on there? i was once eating a violet crumble when hit in the face with a football, totally shredded my lip open. this is by way of saying i have also develop a lip that fat from playing football. Pray tell, what is this ‘violet crumble’ of which you speak? For my next card,I will play THE RACE CARD!